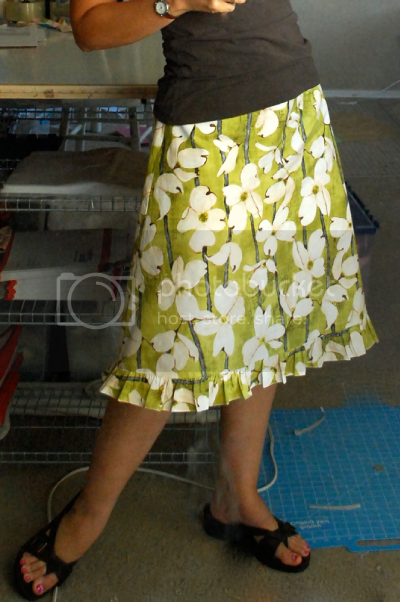 The Essential A-Line Skirt, Part 2: Working the Bugs Out - Stop staring and start sewing! Okay! Time to make the first skirt! I'm loving this skirt style. It's feminine and fun to wear and I hope to have a closet full of them by the end of this summer. I promise to wash my mirror before the next tutorial! Take your time with this first skirt and take notes. You can write in a sewing notebook (a good thing to have!) or make notes on the pattern pieces themselves. 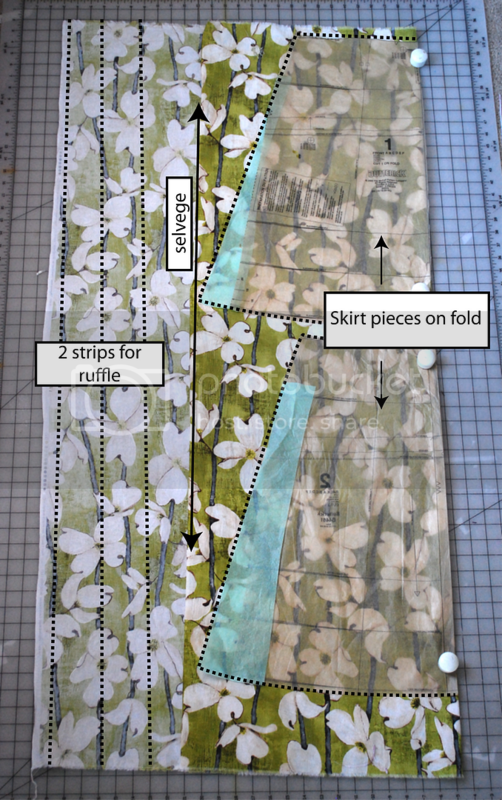 This is my first time making a skirt with this particular pattern so you can sew along with me and I'll show you how I like to make adjustments along the way and hopefully end up with the perfect pattern for me! 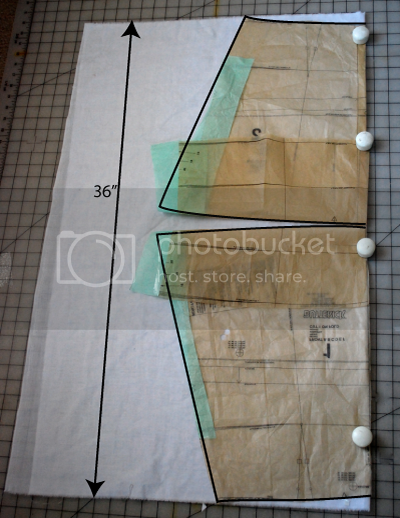 Lay out your pattern pieces like the picture below and cute your skirt pieces out. On the remaining selvage edge cut two strips of fabric for your ruffle. If you are doing a rolled hem your strips will be 2 3/4 inches wide. 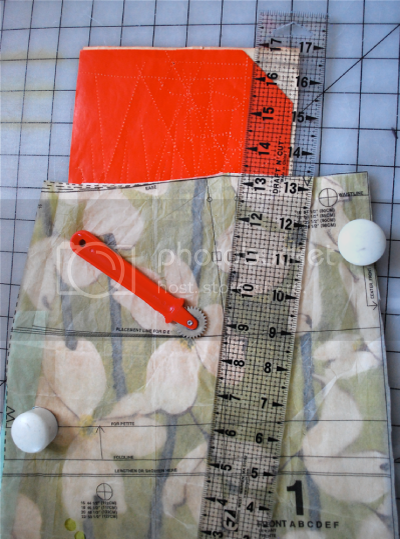 If you're using a regular hem (fold under 1/4" twice and sew) then cut your strips 3 1/4 inches wide. 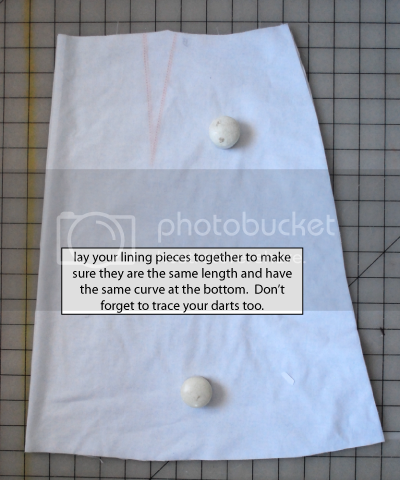 Trace your darts on both the front and back pieces (make sure your marks are on the wrong side of the fabric). Because the skirt pieces look so much alike I like to mark the front and back in pen (up at the top so the markings are in the seam allowance. 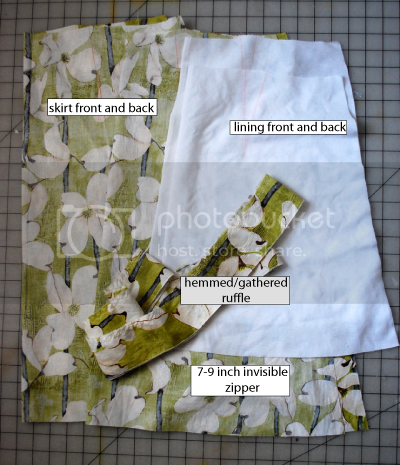 Sew your two ruffle strips together (into a big circle) and hem one side. Sew your gathering stitches in the other side. Use your longest straight stitch (don't backstitch) and make one row 1/3" from the edge and the other one 1/4" from the edge. Now cut out your lining pieces. I just use a yard of fabric so the lining is 18" long. 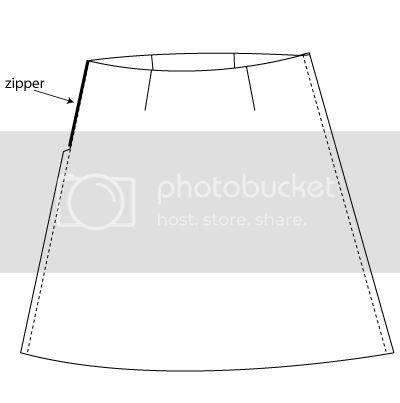 This works well on the basic skirt because it's not bulky and you don't need a slip (which is always a winner in my book since I have 3 daughter who always "borrow" mine so I can never find one). Be careful to cut under your pattern pieces (not through them). Stack your lining pieces and trim them, if necessary, to make them the same length as each other. Trace your darts and mark an F (for Front) and B (for Back) at the tops, above the seam allowance area. So now you have everything you need for your skirt and you can start putting it together. Sew your darts on both the front and back pieces. Now try your skirt on by pinning one side (pin in a straight line at your seam allowance 1/2 inches from the raw edge) then put the skirt on and pin the other side. REMEMBER your finished top edge will be 1/2 inches from the current top of the skirt so if the fit is good at that point you're ready for the next step. My skirt was too big so I took it in by 2" (I took 1/2 inch off each of the 4 sides). Whatever changes you make to your skirt you need to also make on your lining. Now you're ready to put your zipper in. 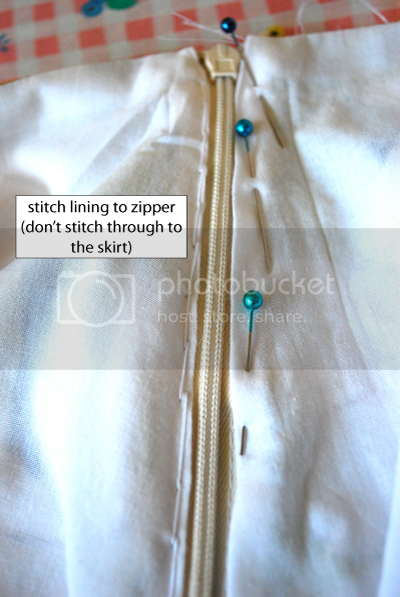 Start with the upper edge of your zipper tape up against the top edge of your skirt piece. I always make mine so the zipper is on my left side when finished (I don't know why). Whichever side you chose, just remember to do it on every skirt that way (or you may end up with your skirt on backwards and not even realize it!). 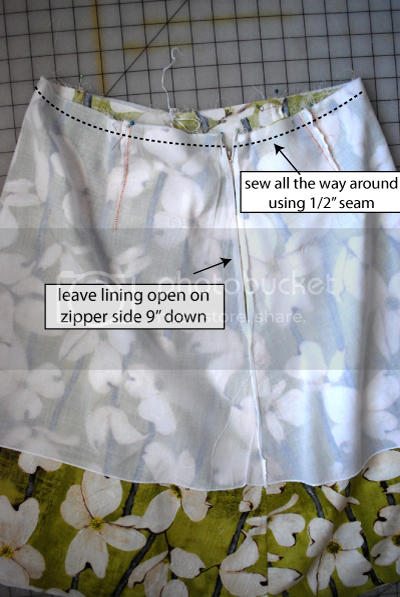 The links for invisible zipper tutorials are here, here (print this one out and pin it above your sewing machine), and a great video here. Do not be intimidated. Conquer your fear of invisible zippers and you can conquer anything! Now finish sewing the rest of the seam below the zipper (if you haven't already) and then sew the other side of your skirt. Try it on again just to be on the safe side. Make any adjustments now (you can take in the darts a little or let them out a little, or take a smidge off the non-zipper side). Sew your lining together but leave it open at the top on the side where the zipper will be (9" down from the top, see next color picture below). 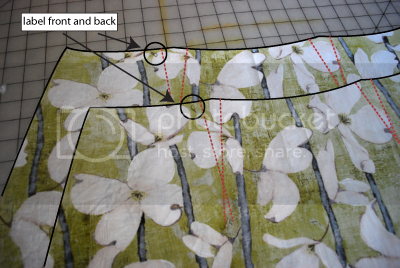 To help you figure which side to leave open just place the lining pieces against the coordinating skirt piece, right sides together, then mark the zipper side of your lining with a pin. Finish the hem of your lining by either using a rolled hem or a small folded hem like you did on the ruffle. 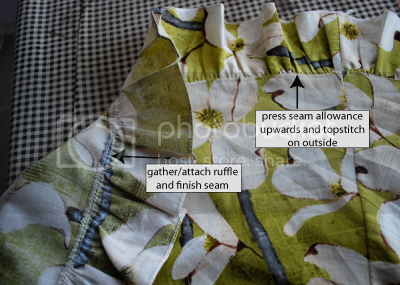 Pin your lining and skirt together with right sides together. When I did mine my lining was too small for some reason so I just let the darts out a little (it's nothing that will affect the look of the skirt when it's finished). Fold the raw lining edges so they are even with the edge of the zipper (the top part of it). 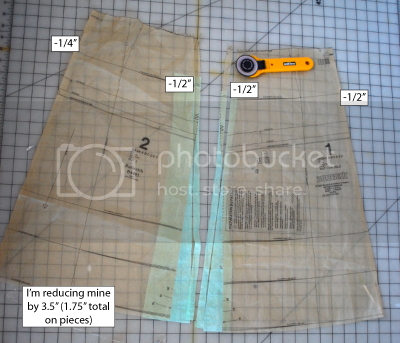 Sew all the way around using 1/2" seam allowance. Now open it up and make sure your seams came out even. 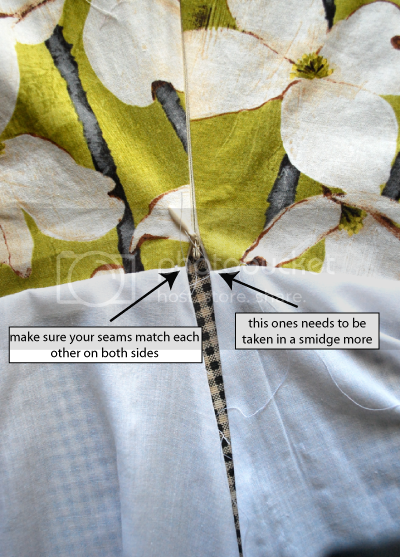 Go back and sew a little further away from your last seam on one side if necessary in order to get them even. Now use a long stitch to tack your lining down at the sides of your zipper (unless you're in a hurry to get to a party, then you can do this later!). Be sure not to sew through the zipper tape to the fabric. Now attach your ruffle by pulling your gathering stitches tighter and pinning (use lots of pins) all the way around (make sure the side seams on the ruffle match up with the side seams on your skirt). Adjust your gather so they are even all the way around (take your time!). And then sew the ruffle to the skirt using a 1/3" seam allowance. Finish the seam by serging or zig-zagging and then press the seam upwards. 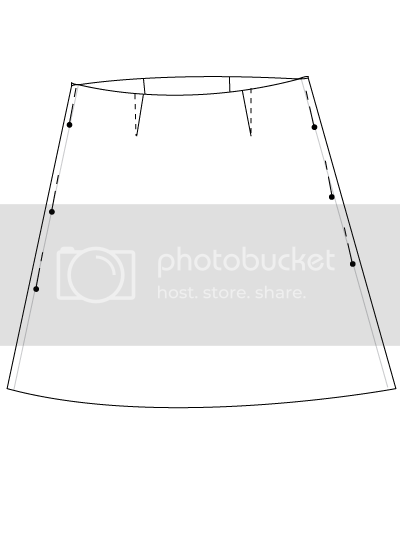 Topstitch close to the seam on the outside of your skirt above the ruffle. I like to press my ruffles down so they're nice and crisp and not "floofy". Now try your skirt on! It's probably perfect but you may want to make some changes on your pattern for next time. When mine was done it was still looser than I needed so I took it in just a little on the non-zipper side. I changed my pattern so that the next time it will be perfect on the first try. 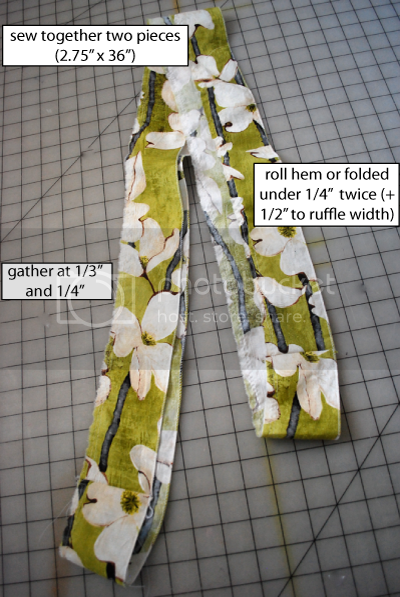 I needed a total of 3.5" taken in at the waist (probably because I played it safe by going with a bigger size and also because I used 1/2" seam allowances instead of the 5/8" the pattern instructions suggested). I made adjustments by removing a total of 1.75" (half of the 3.5" I need deducted from the entire thing) on both sides of each pattern piece in order to hopefully keep my darts in the correct place. I really love this skirt but I know I'm going to be even happier with the next one since I got all the bugs worked out on this one! Let me know how it goes for you! !